Why the 2006 Mazda Mazda3? This is the car that the VW Jetta should have been. It is one of the nicest looking 4 door sedans I have ever seen. It is a relatively inexpensive, entry-level car, but Mazda went to great lengths to give it both the elegance and presence of a BMW. The car is built with care and attention to detail. The materials are well chosen, and the whole thing feels solidly built, inside and out. It feels like a much more expensive car, and any corner-cutting is well disguised. The car handles like a dream. It is perhaps the nicest handling car at this price point - the steering is very responsive and the suspension is stiff enough to handle almost anything the road can throw at it. This is where you get the "sports car" feel. The interior styling is not over the top, nor is it cheap-feeling. It is the perfect mix between functionality, and well-chosen materials that give it a much more expensive feel. The dash is a pure joy to look at. Why Not the 2006 Mazda Mazda3? There is no towing ability (the manual recommends against it), and the trunk, while large, is not as large as many competitors. 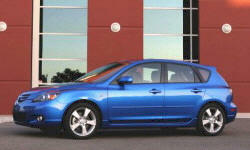 The hatchback model is much more appropriate for those looking for more cargo room. The rear seat is very comfortable for small to average sized people, even for long trips. However, those with long legs will find themselves cramped for legroom. The low roof in the back adds to that cramped feeling. My dealership has been absolutely wonderful. However, some Mazda dealerships have a real reputation for being downright nasty when it comes to warranty claims and the like. It is loud. The road noise may bother some. I do not find it distracting at all, but older customers, or those accustomed to competitor models like the Corolla or Civic will notice a difference.